This year I spent my first new year’s at the San Francisco Folk Music Society’s Camp Harmony. On December 30, I drove up to Camp Newman, which is just outside Santa Rosa, with Graham and Lacey, who have both been attending camp for years. Even though they had told me how wonderful it would be, I was still a little nervous about diving into a completely new experience with so many new people. Turns out I had nothing to worry about! We arrived early to help set up, and the first person I met, the camp director, gave me a hug and a warm welcome. We got to work assembling the rented dance floor and had many more happy reunions and introductions throughout the day, particularly with Quena and Jonathan, who are an integral part of Graham and Lacey’s extended ‘family’. That night the real fun started with the first dance of camp, an English country dance. 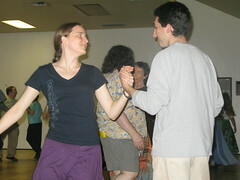 Harmony is a home-made camp, so anyone can lead or attend workshops for all kinds of music and dance. 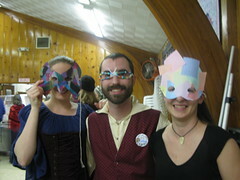 I particularly enjoyed the Irish dance workshops, and had a blast at the swing/rock’n’roll night. 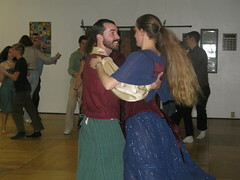 Got in lots of good contra and country dancing as well, and even a bit of square dance! Unfortunately between all the dancing and some steep hills at the camp site, my right knee got sort of wonky and I had to take it easier the second half of camp. Luckily there was plenty to do besides dance. In fact, it was sometimes hard to choose among all the great classes and sessions being offered, even though there were about 7 hours of workshops every day! I took advantage of the supportive atmosphere to try something new and attended a beginning recorder class. It was fun to work out how to play simple tunes like “Doe a Deer,” and someone was kind enough to give me an extra recorder to keep and practice with. Some of my favourite parts of camp, though, were definitely singing. I loved being able to show up with nothing but my voice and join other singers and musicians to jam and swap all sorts of songs. There were two great Shape Note sessions, along with workshops for Disney songs, classic pop songs like Simon and Garfunkel, rounds, Balkan a cappella, musicals, and much more. Camp was just bursting at the seams with good music and fellowship. People were happy to pull out their instruments and play just about anywhere, from their cabins to the dining hall and even along the paths in-between! The total immersion in the arts was really the best thing about Camp Harmony. Being surrounded for five days by wonderful song and dance was good for my soul, and a lovely respite from the regular world. It helped that I didn’t touch a phone, computer, or car for the whole time, so I was wholly present and engaged in the people and activities around me. Okay, so I did bring a book, but I promise I didn’t read that much. Mask making. I much admired Graham’s mask from last year, and was fairly pleased with how mine turned out. More and more people joined in, linking arms and raising their voices in a swell of sound that drowned out all thoughts and feelings but love and joy. It was fabulous. Plus, I finally found an occasion to wear the cool purple corset Sandra got me last year. 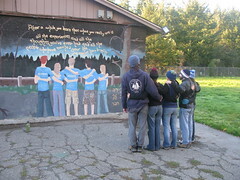 Checking out the cool murals on the buildings at camp, especially this one of ‘friends’. 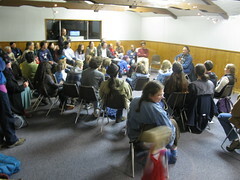 Bob Reid’s kid’s concert, which was attended by ‘children’ of all ages (like me). Unlike many of the camp regulars I didn’t know the songs, but most were easy to pick up and sing a long to, and all of them were either fun or touching or both. Cramming 12 people into a small room in the dark to surprise Katie, the camp director, for her birthday. 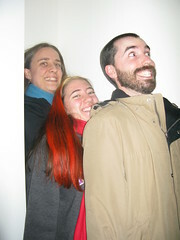 I think we were hiding there for almost half an hour! Overall it was a great experience, definitely worth repeating. Even though it felt sort of like a break from the “real” world, I’m hoping some of the spirit from camp will carry over into the rest of this year and inspire me to keep singing and dancing and trying new things.